If you like old school gear that seems like it would kill you if you look at it wrong, well, we have an auction for you. The Telephone Pioneers of America was a group founded by various employees and bigwigs at telecom companies back in 1911. Alexander Graham Bell, the man Americans are often taught invented the telephone, was an early member. At first, it was a way to create a community around the various people who pioneered the tech of telephony, then it shifted to a philanthropic mission. These days, it functions as a network of volunteers that help out in their community. 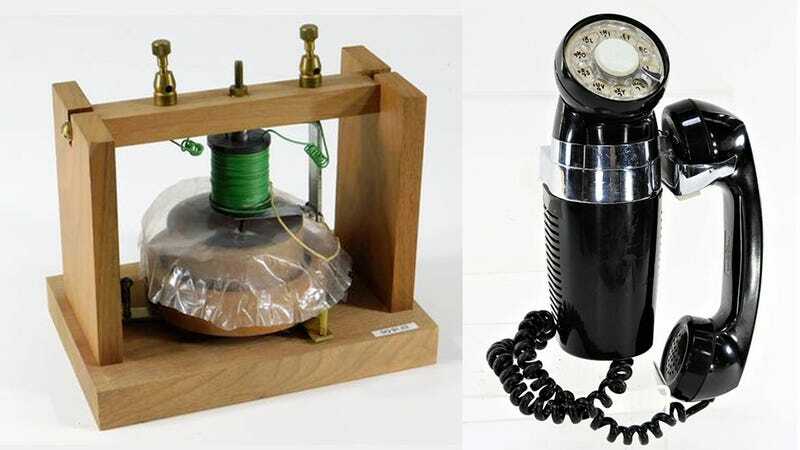 Along the way, the non-profit set up a bunch of little museums around the U.S. dedicated to preserving old equipment and ephemera related to the history of the telephone. Now, two of those branches are closing and you can buy their goods in an auction online or IRL on August 4th. Bruneau & Co, an auction house based in Cranston, Rhode Island, will handle the bidding. While it’s called “Verizon’s Telephone Pioneers Museum Collection Auction,” it’s unclear what Verizon has to do with it. When we contacted the auction house, they weren’t totally sure, and sure the museums themselves have no online presence. We reached out to Verizon to ask and a spokesperson told us they would look into it. UPDATE: A Verizon spokesperson informed us that the company has nothing to do with this, and they have no idea why their name is being used in relation to the auction. Regardless, this is an opportunity for the collectors and hoarders out there to pick up some pieces of history. Or, if you’re like me, it’s an opportunity to ogle some cool stuff. You can see the hundreds of available items and bid on them here. Everything has an estimate of $10-$10,000 and it appears very few items have bids. We pulled a few of the cooler pieces for you to check out below. President Dwight D. Eisenhower’s personal telephone from his “Summer White House” in Newport, Rhode Island. Eisenhower used this classic rotary style phone in the summers of 1958 and 1960. The moments in history that could’ve been discussed on this phone include the signing of the National Aeronautics and Space Act (NASA) which occured on July 29, 1958. Before the days of unlimited plans that aren’t really unlimited, people used payphones, and calculagraphs were used to keep track of the time spent on the line before another dime would need to be inserted into the coin slot. The device was used in many different mechanisms following its patenting in 1897, including employee timeclocks and pool hall table rentals. What boardroom shenanigans would this baby speak of if it could talk? This item is described as, “an early example of the first long distance double pole receiver,” so I wouldn’t go assuming that this is the actual receiver used in the first phone call over a long distance. It’s still cool and would probably be pretty easy to get working. For when your ringer needs more cowbell. Just something for the tube enthusiasts out there. The auction includes many examples of the giant switchboards that operators used to connect calls up until the mid-20th century. This little switchboard is a more practical option for someone who doesn’t want an organ-sized antique in their house. It’s metal as hell and you have to crank it to make a call. This is awful, and we don’t know what in god’s name it actually is. But rest assured you will face no bidding war, if you want it.